Dr. Mamatha Raghuveer, Founder, Tharuni, attended a Meeting organised by ICDS Khammam on 28th January 2017, as a Resource Person, at TTDC Bhavan.She presented on the PCPNDT Act 1994 and Amendment of 2003 in detail.The Anganwadi workers should enlighten the pregnant women about the Act. The Scan Centers should not inform the gender of the child, in advance. The Doctors and the Scan Center Managers will be punished, with 3 year Jail ,and Rs. 10,000/- fine, if they reveal it. If they they are found guilty for the second time they will be punished with 5 years Jail and Rs. 50,000/- fine,Dr. Mamatha said. Dr. Mamatha also presented on the Juvenile Justice Act, and Child Marriage Prohibition Act in detail.The Speakers reiterated about the importance of Girl child, as an asset to the Nation. 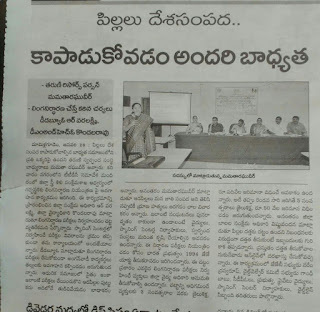 The Director of Medical and Health Kondal Rao, CPDO Varalakshmi,CWC Member Gandhi Babu, Child Welfare Officer Vishnu Vandana, J J B Member Narendra Singh, Doctors, Private Scanning Center Managers,Child Line Representatives, Anganwadi and Asha Workers from the district participated in the Meeting. Adoption of the Child can be applied through online now, Vishnu Vandana stated.